Hurray! Bake Fest returms to The Pumpkin Farm after almost half a year. Baking is my passion these days and I am so much into it that I constantly look out for recipes that fit the bill of my family's taste buds and my hectic schedule. What better way than inviting all of you to come and tell us about what you have been baking around? The event will be active from 1st July to 31st July. 4. 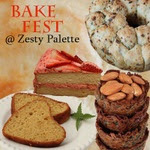 Link to Vardhini's Bake Fest announcement and this page is mandatory. If sending an old entry, it needs to be re-published with the links. Will send my entries, Happy hosting Pradnya. Please visit my blog as i posted 1 new entry of heavenly coconut macaroons http://tangymind.blogspot.com/2012/07/heavenly-coconut-macaroons.html and 1 archived entry Creme Brulee http://tangymind.blogspot.com/2012/07/fantastique-creme-brulee.html .I posted ur logo on my 2 recipes on my blog.Awaiting to hear your comments dear.Please follow me and like my FB page TangyMinds. hey Pradnya..just linked up my entry..somehow its not showing up...cud u plz do the same for me if it has not been linked.Thnx! Same here Pradnya. Mine is also not showing up after linking. to date with recommendations and other updates without accessing the dedicated app. to a group, make sure you read the group posting rules.